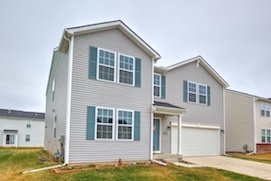 This home in Thornton Farms is the Traverse Model and is perfect for a growing family in need of space. The main level of this home has a spacious flex room, large kitchen with an eating nook and an over-sized great room. The flex room in the front of the house could be a living room, dining room or study. The large kitchen is open to a dining nook. The warm rich cabinetry is fresh and plentiful. This kitchen also features a walk-in pantry. The dining nook opens to the back yard through a sliding door, perfect access for entertaining indoors and out. The over-sized great room has a step-down and a cozy fireplace. A guest bathroom completes the first floor. Upstairs, this home offers two full baths and four spacious bedrooms. The gracious master suite is complete with all the amenities, a large walk-in closet and nice private bath. The remaining three bedrooms share a full bathroom. A huge loft can be used for a play room, home office or craft area. A convenient laundry room completes the second floor. 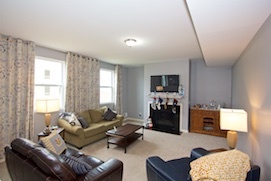 There is plenty of storage in the full basement with an egress window as well as in the two car attached garage. Thornton Farms is a charming community that is conveniently tucked away just minutes from major freeways and downtown Ann Arbor. More than just a place to live, family fun awaits you at the community pool and clubhouse. Put this Dexter real estate gem on your list to see today!